“Throughout history, artists have grappled with the problem of depicting clearly and forcefully the principles of evil and suffering in human existence.” With this view, the Lehners have collected 244 representations, symbols, and manuscript pages of devils and death from Egyptian times to 1931. Reproductions from Dürer, Holbein, Cranach, Rembrandt, and many other lesser-known or unknown artists illustrate the fascinating history. The fifteenth, sixteenth, and seventeenth centuries are stressed. The book is divided into 12 chapters, each with a separate introduction. Most of the illustrations are collected in five of these chapters: Devils and Demons, including Belial, Beelzebub, and the Anti-Christ; Witches and Warlocks, their animals, forms, and rituals; The Danse Macabre, with the Dance of Death Alphabet by Holbein and representations of all classes leveled by the common force of death; Memento Mori, including a skull clock, a macabre representation of the Tree of Knowledge and Death, and the winged hourglass and scythe; and Religio-Political Devilry, the fight between the Papists and the Reformers, and symbols of devils in other political disputes. There are also chapters on the Fall of Lucifer, Faust and Mephistopheles, Hell and Damnation, The Apocalyptic Horsemen, Witch-Hunting, The Art of Dying, and Resurrection and Reckoning. 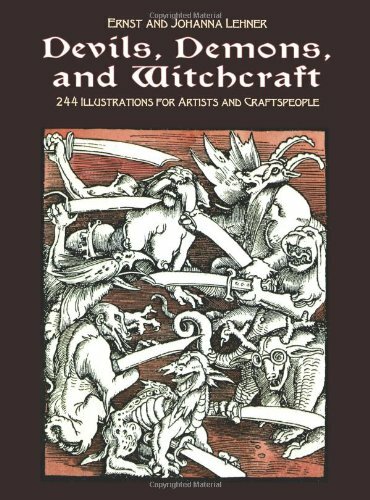 Anyone curious about witchcraft, death, and devils will be interested in this book. It is particularly useful to teachers, artists, and illustrators who need clear reproductions for the classroom, for models, or for commercial uses. Death, devils, and their history are very much with us today.